PARKVILLE of Mo. 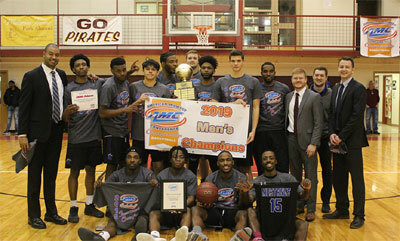 - The fifth-seeded Mustangs from Central Baptist College won the American Midwest Conference (AMC) Men's Basketball Tournament Championship. The Pirates defeated No. 2-seed Park Pirates of 71-63. With the win of the Mustangs earned the AMCs second automatic berth to the NAIA Men's Basketball Division I National Championship in Kansas City. The Mustangs jumped out to a quick 8-4 of highlighted by a pair of 3-point field goals. After the two teams traded buckets of Blue Johnson of Park knocked down a triple to tie the game at 9-9. Over the next 4:30 of play of the Mustangs went on an 11-4 run of taking the 20-11 advantage with 9:37 left in the first half. The teams would once again trade baskets. The Mustangs were able to push their lead past ten (26-15) for the first time after a 2-point bucket from Jordan Ford (6'3''-G). After a Josh Rutland (6'0''-PG) field goal cut Parks deficit to nine (26-17) with 4:18 left in the first half of the Mustangs closed out the opening frame on a 10-5 run and took a 36-22 advantage into the locker room. The Mustangs shot 58.3-percent (14-of-24) from the field in the first half and Park went 8-for-21 (38.1-percent) from the field. The teams would continue to trade baskets over the next couple minutes. Zach Rutland (5'7''-PG) knocked down a corner 3-ponter to give Park its only lead of the game at 46-45 with 10:42 remaining. Central Baptist hit clutch free throw after clutch free throw down the stretch of including five in the final 1:15 of the game by Tyrone Alston (6'0''-PG) to clinch the game. Percell Washington and Tyrone Alston scored a team-high 21 points for Central Baptist. Alston's 21 points was his most in a single-game since scoring 21 against St. Louis Pharmacy on Feb. 2. The Pirates shot 51.0-percent (25-of-49) from the field and 36.4-percent (4-of-11) from the 3-point line. Central Baptist went 8-of-16 (50.0-percent) from the 3-point line and 51.1-percent (24-of-47) from the field. The Mustangs went 13-of-16 from the free throw line in the second half. G: Deandre Clark (6'3''-G) of Harris-Stowe St.
PG: Nate Rigmaiden (5'10''-PG) of Harris-Stowe St.
F: Calvin Giles (6'8''-F) of Harris-Stowe St.
F: Brenden Gillman (6'5''-F) of Lindenwood-Bellev. G: Devonte Lash (6'5''-G) of Harris-Stowe St.
F: Ernest Docker (6'7''-F) of Lindenwood-Bellev. G: Isaac Matthews (6'1''-G) of Lindenwood-Bellev. C: Jaap Mustaers (7'0''-C) of Lindenwood-Bellev. : Jaron Gaston of Lindenwood-Bellev. G: JC Moll (6'1''-G) of Lindenwood-Bellev. C: Jeffery Martin (6'5''-C) of Lindenwood-Bellev. C: Kamron Matthewson (6'7''-C) of Lindenwood-Bellev. G: Riley Barnes (6'2''-G) of Harris-Stowe St.